We are all eager to learn how best to keep our brains healthy as we age and much research is underway in that regard. 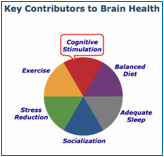 While evidence is still building in many areas, it is clear that certain aspects of a “brain healthy” life style have no downside and should be considered as potential, immediate additions to our regular routines. While the most well researched avenues to brain health are balanced diet and physical exercise, there is mounting support that these other four areas should be seriously considered in anyone’s strategy to age with cognitive vitality. Among the public, there is particularly strong interest in learning more about the benefits of cognitive stimulation. To stay sharp and defer brain decline, the scientific evidence shows that the odds of success are significantly increased by living a “brain healthy” lifestyle and that wide and varied cognitive stimulation is a critical element of such a lifestyle. To achieve that, one must engage regularly in brain activity that spans the use of all the major brain functions of language, memory, attention, visual-spatial and logic and reasoning activities. This can be difficult to achieve consistently over time. One way to activate all these brain functions on a consistent and regular basis is to play specially designed brain games and to participate in evidence based brain-training programs. These games are designed to be engaging and by most accounts they are generally fun and entertaining. You have nothing to lose and a lot to gain, most notably, staying sharp!